easyDCP Player+ is a JPEG2000 decoding software that was created for the use of post production facilities and digital cinema production. It allows to playback DCPs (Digital Cinema Packages) without specific cinema equipment on a PC or MAC. 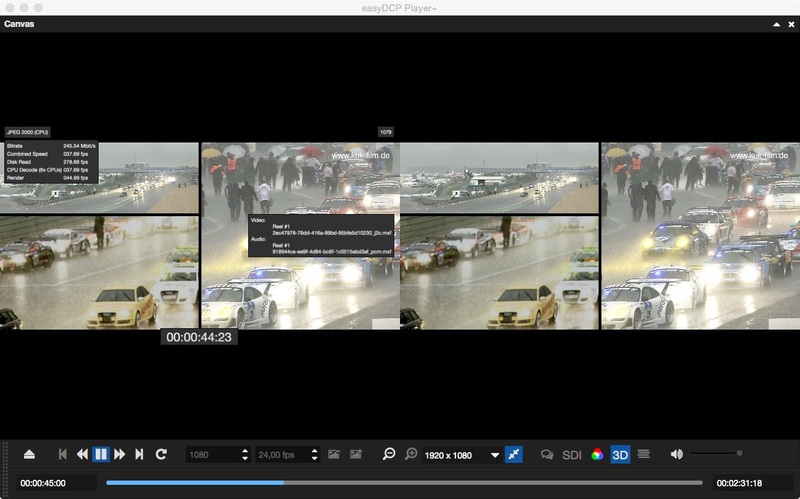 Additional functions in easyDCP Player+ are the playback of encrypted DCPs, non-encrypted IMF packages stereoscopic DCPs, and extensive export functions from DCPs in separate video and sound files. For a first experience with this software and the DCP playback we offer a free download of a special trial version easyDCP Player+. The trial version allows playback of any DCP for 15 sec.